The ride quality on my '13 ML350 4matic is pretty rough. Took it to the dealer and they advised to change the tires because they have worn out. I currently have Dunlop Grandtrek Touring A/S on 19" wheels, and have driven 33000 miles on them so far since new. I checked the tire wear bar and yes they are almost the same as the bar. So agreed I need to change the tires, and currently considering a set of Continental Extreme Contact DWS06. However, do the tires entirely attribute to the rough ride? I have a feeling that something is not right with the suspension. We have pretty rough roads here around Portland, OR, and every time I drive over imperfections or slightly bumpy road surfaces (not pot holes or sharp imperfections), the car jumps way too much and I can feel the bumps. I expect the ride to be smooth over these small bumps on road surface (the bumps I am referring are from patched road areas due to a nearby construction), and expect the suspension and shocks to absorb the effects of the bumps and keep the ride smooth. Is this normal on a ML? Or is this an indication of something wrong with the suspension or shocks or ball joints? When is it recommended to replace the shocks/suspension? My '13 ML has done 58330 miles so far in 5 years. Is it time to change the shocks/struts/suspension? Please advise. 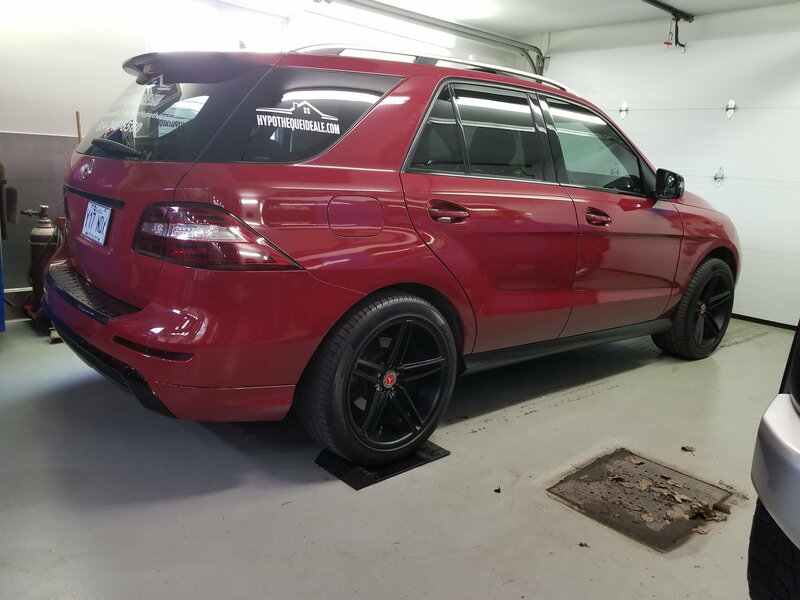 I have a 2015 ML350 with approx the same mileage as yours and with the original tires. I purchased it CPO after having owned an FX35 Infiniti. The ride of the ML was definitely softer but alot more bouncy, more truck like. After getting the ML I noticed immediately on certain road, i.e. concrete, it had more vibration and noise than the FX35. I think you will always find the ride bouncy compared to other SUVs. Some people on this site have replaced the springs, with a H & R spring which lowers it slightly but makes the ride more controlled. I personally would like to do this but not sure I want to spend the extra money. I think news tires would help for sure. I am in the research phase of new tires for my ML and will probably get the Michelin Premiere LTX. It seems provide a quiet ride. My ML's ride is definitely rough. It'a almost as if i don't have shock absorbers sometimes. I plan on putting H&R lowering springs on it. I swapped out my OEM Continentals about a year ago for the Michelins and have been very satisfied with the quiet, secure ride with all four at 36 psi. The side wall is also a little softer than the OEMs, so they contribute to a smoother, more comfortable ride. Treadwear has been acceptable. Good handling with no hydroplaning. You wont achieve a smoother ride with mounting lowering springs... That's the opposite in fact. Normally, the ML has a smooth ride, much smoother than X5 for example. If you have airmatic, you can get it quite stiff. But on steel springs it should be smooth. If you get big tires, like 20 or more, obviously the ride quality will lower dramatically. Especially if you like to over pressure your tires. To me, tire size and pressure and the biggest culprit when it comes to ride quality, especially on a car that is relatively smooth by default. Using a slighty larger tire might help. No airmatic and continentals ride very smooth for me! When I switched from the Dunlop GranTreks that came with my ML350 to Continental DWS06, I noticed a much harsher ride. It of course handled tighter. Comfort mode was no longer comfortable, and Sport was unbearably choppy and bouncy. I replaced the DWS06 with Continental CrossContact LX20, and they are smoother than the DWS06 but still harsher than the GranTreks. However, now that I've found that I have a bad left rear shock, I'm not sure if the harsh ride was attributed to that or whether my shock was going bad with the GranTreks also (but never noticed). Tried Continentals and Pirelli Scorpions. My 2014 ML350 Rides rough when the are bumps, curbs and man holes. I claim the fact that Mercedes insist on putting 20+ inch wheels on them and a 45 sidewalls. That's just not enough rubber to absorb the bumps. I'd much rather have a 65 sidewall, 18" wheels and a smooth ride. Bought this one new loaded out. Expected more for 69k. I've tried Continentals and Pirelli Scorpions. I think I like the Continentals better. Will definitely shop around for a smoother ride next time. Last edited by cbarclayiv; 05-30-2018 at 09:40 PM. Reason: Additional details. Our 2013 ML350 BT had a boringly smooth ride. Compared to our X6 and my now-gone Grand Cherokee SRT, the ML felt like it was riding on a cloud. No Airmatic, btw. We've since dropped the rear with H&R springs and swapped out the 18" rims for aftermarket 20 inchers on much wider rubber. 20" wheels increase un-sprung weight, so don't expect your ride to get softer. We now love the ride on the MB, even the steering wheel is a bit firmer when stopped or at low speeds. Love it! I have 19 inch wheels on mine and I would never upgrade to 20 because of the rougher ride. One option might be to put either 19 or 18 inch on your car. I bet there someone wanting to upgrade to 20 inch. Most ML come with 19 inch. I know some people put 18 inch on theres for the winter. The older diseal models came with 18 inch wheels. Hi Peter. Your car looks very nice. You just lower the rear axle? What about the bouncy ride. It’s more, less or remained the same? Somebody know how to fix this problem? Yes, only the rear axle has the lowered springs. We didn't like the very soft ride, nor the "rear in the air like a gorilla waiting to be mounted" look. The ride is definitely more firm, but as mentioned before, we didn't like the "on a cloud" ride of the ML350 to begin with. We own a BMW X6 which has a firm ride, and I just sold our Grand Cherokee SRT which also had a firm ride. Although I'm almost 60, I'm not ready for a cloud-like ride. My wife is only 44, definitely doesn't want a puffy ride either. Was there ever a resolution to the bouncy ride for the original post? I have a 2015 ml350, about 39K mi, that is pretty new to me. I didn't notice anything abnormal for the first 2000 miles I owned it, and now small bumps or dips in the road seem to create a side-to-side bounce like turbulence. At times it even feels like one side will dip briefly on it's own. It does NOT have the airmatic suspension. Dealer isn't finding anything, although they can feel it with a drive. On flat highway at higher speeds it's smooth as can be, but side roads with some variation of pavement or small bumps and dips are uncomfortable and unsettling to drive on. There isn't any new noise or shake in the steering.